384 pages | 115 B/W Illus. Since the first edition of Stochastic Modelling for Systems Biology, there have been many interesting developments in the use of "likelihood-free" methods of Bayesian inference for complex stochastic models. Having been thoroughly updated to reflect this, this third edition covers everything necessary for a good appreciation of stochastic kinetic modelling of biological networks in the systems biology context. New methods and applications are included in the book, and the use of R for practical illustration of the algorithms has been greatly extended. There is a brand new chapter on spatially extended systems, and the statistical inference chapter has also been extended with new methods, including approximate Bayesian computation (ABC). 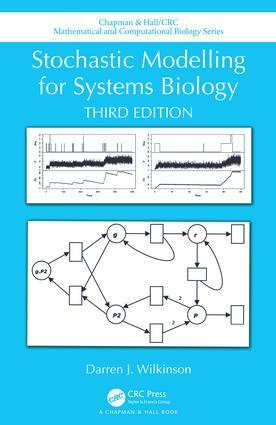 Stochastic Modelling for Systems Biology, Third Edition is now supplemented by an additional software library, written in Scala, described in a new appendix to the book. Keeping with the spirit of earlier editions, all of the new theory is presented in a very informal and intuitive manner, keeping the text as accessible as possible to the widest possible readership. An effective introduction to the area of stochastic modelling in computational systems biology, this new edition adds additional detail and computational methods that will provide a stronger foundation for the development of more advanced courses in stochastic biological modelling. Darren Wilkinson is Professor of Stochastic modelling at Newcastle University in the United Kingdom. He was educated at the nearby University of Durham, where he took his first degree in Mathematics followed by a PhD in Bayesian statistics which he completed in 1995. He moved to a Lectureship in Statistics at Newcastle University in 1996, where he has remained since, being promoted to his current post in 2007. Professor Wilkinson is interested in computational statistics and Bayesian inference and in the application of modern statistical technology to problems in statistical bioinformatics and systems biology. He is also interested in some of the “big data” challenges that arise in bioscience and more generally. He serves on Biotechnology and Biological Sciences Research Council’s Strategy Advisory Panel for Exploiting new ways of working and is co-Director of Newcastle’s Engineering and Physical Sciences Research Council Centre for Doctoral Training in Cloud Computing for Big Data. He is also a Fellow of the Alan Turing Institute for data science and artificial intelligence.